Behold Costa Brava, where mile after mile of coastal scenery, secluded beaches, and impressive natural parks await your arrival. The region's fantastic tourist infrastructure and excellent weather make Costa Brava the perfect destination for a camping holiday. With its millenary history, exceptional natural setting, and fantastic tourist infrastructure, Costa Brava is a clear winner when it comes to camping holidays. Everything you may wish for is here: from lively resort towns to low-key villages by the seaside. Why should I go camping in Costa Brava? Located a few steps away from Estartit beach, this luxury camping site offers family-friendly accommodation in 2 and 3-bedroom mobile homes equipped with a private deck and BBQ area for al fresco dining. Deluxe bungalow tents afford panoramic views over the Medes Islands. Other perks include a kids' club and a large shopping area with a bakery, a hairdresser, a supermarket, and a bookstore. Set in a spectacular setting on a hill overlooking the sea, this campsite offers spotless accommodation in luxury tents and mobile homes fitted with French doors and a private terrace. A mini train takes you to Calonge beach, one of the best-rated in the region. 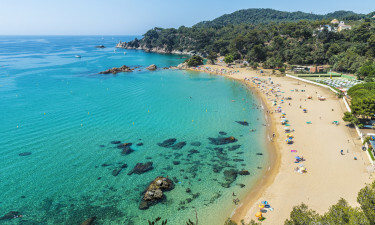 Costa Brava is a natural paradise with more than 160 miles of coastline, dotted with pretty fishing villages, resort towns, and golden sand beaches. Some of the best-rated Costa Brava beaches include family-friendly Tamariu, Port de la Selva, and Cala del Pi. Further inland, Cap de Creus National Park offers an impressive mix of rocky outcrops, coastal views, and forested areas. Visit the beaches at lovely Cadaques and stop by at Salvador Dali's museum. Girona is a bustling city with a picturesque location and with one of the Spain's best-preserved medieval Jewish Quarters. 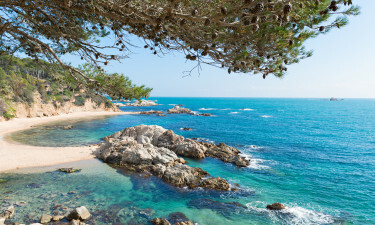 You can also set on a delightful wine route along the Emporda area, or spend an unforgettable night out in Palafrugell's harbour listening to a habaneras concert, which brings Caribbean sounds to the summer nights in Costa Brava. For a fun family day out, book a glass-bottom boat tour around the beautiful Medes Islands. 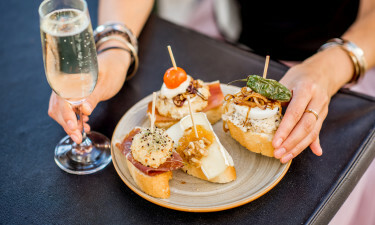 More than 2,500 restaurants await you in Costa Brava, including Michelin-starred El Bulli and El Celler de Can Roca. The local cuisine consists of mouthwatering fish and seafood dishes like caldereta (a fish stew) or mar i muntanya (a paella-like dish that combines meat and seafood). Local wines like Empordalia and Setzevins are packed with fruity notes, and to immerse yourself into the local culture, visit the Catalan Music Festival in Estartit or Girona's first-class museums. The Costa Brava region is blessed with a mild Mediterranean climate. Outside of the winter months (December to February), the weather is pleasantly balmy throughout the year. Average temperatures reach 17°C by the end of March and continue to climb until August, when daytime temperatures reach the high 20s. Even during the hottest months, a refreshing breeze brings temperatures down, and average sea temperatures stay around the 20°C mark year round. 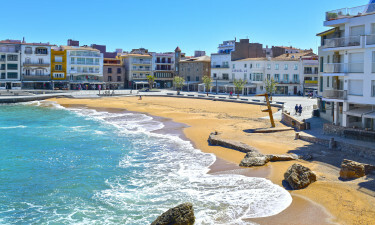 Greeks and Romans discovered the untapped potential of Costa Brava centuries ago and founded important cities whose ruins can now be visited at sites like the Empuries archaeological complex. During the Middle Ages this region was a thriving commercial hub, and many castles and fortresses were built. Some of those constructions are now part of Costa Brava's heritage, like the stunning Peralada castle (now turned into a museum and into an exquisite classical music venue) or Begur's hilltop fortress.